Your cover letter should be a proof to tell to your manager that you are the right person for the job. Be passionate about the job as much as you can. Try to write a cover letter in such a way that the employer should have utmost belief in you. There are many ways in which you could write the perfect cover letter. As when you write a love letter, you try to express your passion and interest towards the recipient. A good cover letter should be similar in that manner. You are expressing your love for the job to the employer via the cover letter. What Cover Letter Should Include? While writing a cover letter, you should assure the recipient that you are always ready for any circumstance and that you are ready to face any emergencies or challenges that occur. The main purpose of a love letter is to convey the other person that you are willing and ready to protect and safeguard them. Similarly, a cover letter should be seen as a way of communicating your interests for the job towards the employer. State what all goals you have achieved for the company during your previous job. Try to create an impression that you are well adapted for working under pressure and stress. Try to take the role as a problem solver. Make a good impression for the employer that you are a reliable person when an emergency arises. Also include examples of instances where you have played a key role and achieved positive results. For example, you could include instances like “During my previous job, I worked as a sales representative and as a part of my job, I created lists of potential clients and customers and tried to secure a large number of deals for the company.” the employer gets an idea that you are a hardworking individual and that you are very meticulous in your work. Love letters are used to court loved ones, by expressing their interests for one another. Talk about the little things that make them special to you. Knowing one another builds a strong sense of trust and loyalty between one another. Love letters explain why one person loves the other. Writing a love letter makes them special and feel loved. Before submitting a cover letter for the job, make sure that you know the basic details about the employer. One of the common mistakes that every jobseeker face is that they always write incorrect information about the employer. Sometimes candidates mix up the gender of the employer, they may incorrectly write the name of the employer, or address the employer wrongly in terms of his/her designation. All these mistakes can be prevented with the help of a simple research. Try to ensure that you know all the basic details about the employer correctly. Moreover, learn about the needs of the employer and understand what they need to see in their ideal candidate. Try to reflect these qualities to the employer through your cover letter. When creating a love letter, try to include points and details, so that “the only one“ likes it. Love letters can be in the form of a long poem, how you feel for them and tell them what all details you like about them. Make sure that the feeling is mutual and resonates with each other effectively. To create the perfect cover letter, always think carefully about what to write and what not to write. Take some time for thinking. Try to ensure that each and every word creates an effect to the employer. Instead of slapping a bunch of information about yourself and your achievements, try to present the information in a systematic manner. Try to draw more attention towards the overall construction of the project. Spend more time in phrasing the cover letter correctly and cross check every once in a while. Ensure that the punctuation is right and there are no spelling mistakes. No employer wants a jobseeker who presents a poorly written cover letter. When you write a love letter, there is only one underlying purpose: to declare to them how much you feel about the other person and to convey your love and devotion to them. Try to show how much love you feel about the recipient. A cover letter should be written in a similar pattern. You should convey your love towards the job that you are applying to. In your cover letter, state the reasons that why you think that the job is ideal for you, and state the reasons that why you think you are the ideal employee for the job. Sell your characteristics to your potential employer through your cover letter. Explain what all qualities you have with the appropriate examples. Also, explain the reasons what aspect of the job you love the most, to the employer. The employer should get a clear image of how passionate you are about the job. Love letters are written to attract one’s attention and to let them know how much love you feel towards them. It is a great way to show your degree of interest and passion towards the recipient. Try to tempt them and make them feel wanted and loved. Also, try to make them contented by stating why you feel an interest towards them. The cover letter should be written in the same manner. A cover letter should also have points and details that shows how much researching you have done about the company. Try to write a cover letter that will attract the employer’s attention towards you. Write sentences and phrases that will attract them. Also write reasons why you think the company is a good option for you. Provide appropriate explanations about the various working traditions of the company. This will create an impression to the employer that you have done a thorough research about the company. This will easily impress the employer. Exemplify and stress out your strengths and capacities. Do not use overused terms like “team player” or a “people – person”. Try not to be clichéd in your approach and also in your writing style. Try to be descriptive about your skill as much as possible and back it up with a suitable anecdote. While writing a love letter, one of the main points that stand out is how the sender expresses their love for the recipient. Consider the cover letter as a chance to serenade the employer with your words and points. Try to woo the employer by stating the qualities of the employer. A cover letter should contain examples and statements on how much you love and look up to the employer. Point out what all qualities of the employer you admire the most. Also, add examples to back up your statements. Also, try to praise about the works of the employer. At the end of every love letter, there is a phrase that intimates future meetings with the sender and the recipient. Many love letters end by asking the recipient questions like “will you be my valentine”, ”will you be the love of my life” and so on. This decides whether the recipient wants to continue the relation or take the relationship to the next step. A cover letter should also have a similar purpose. A cover letter should be successful in providing any interests for future interactions between the candidate and the employer. Try to make sure that you are successful in getting a positive response form the interviewer. Try to extend support from the employer and add phrases like “I would like to know more about the job” or “I would like to meet up and discuss about the job in person” and so on. Try to give subtle hints to the employer that you are ready to do the job and have a genuine interest towards the job. This gives the employer a sense of assurance while hiring you as the new employee. How to Write a Cover Letter That Gets You the Job? 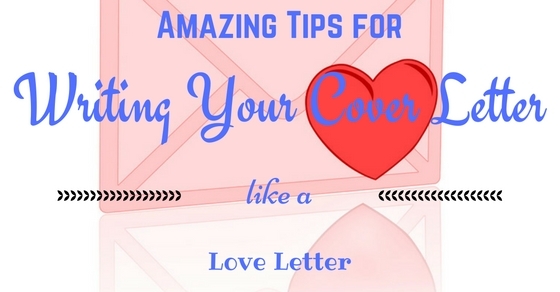 While writing a cover letter also make sure that it should not strictly look like a love letter. Do not try to make it awkward to the sender, if they do not know who you are. Try to be as subtle as possible while writing such cover letters. The trick to writing an ideal and a successful cover letter is by finding the perfect balance. Do not give the impression that you are stalking the employer. There are several guidelines that should be followed when writing the perfect cover letter. 1. Try to use the interviewer’s correct name and designation when starting the cover letter. Try to find out the relevant information about the employer. Also make sure that the name of the organisation and the job title is spelled correctly. 2. When writing the perfect cover letter, do not try to make the cover letter haphazard and hard to read, as this would waste the time of the employer. Try to follow a certain standard when preparing the cover letter. 3. Try to include keywords that best describe the qualities of the employee that the employer is looking for. Keywords should be eye catching and attention grabbing for the employer. This should make the employer more interested about you and this increases the chances of your selection. 4. Make sure that the cover letter is not too crowded. Try to contain the whole letter within 3 to 4 paragraphs. This is for easy reading by the employer. 5. Try to be as brief as possible about various aspects. The employer might be an individual who do not have much time to carefully read all the cover letters sent to him. So for an effective reading, make it short and simple. 6. Try to be formal in language while writing a cover letter. Also use phrases like “yours sincerely” and “yours faithfully” depending on the content of your cover letter. How you end the cover letter should also depend on how you start the cover letter, especially when using salutations or by addressing by their first names. 7. Do not try to introduce anything new and unwanted in your cover letter that was not included in the resume or CV. 8. As mentioned before, the cover letter is a brief summary of the candidate’s resume or CV, so try to ensure that there are no repeating or common words that are present both in the CV and in the cover letter. 9. Try to include your goals and aspirations that aligns with the aim and target of the company. This shows how much you are compatible with the work culture of the company. 10. Try to keep the cover letter as unique and interesting as possible. Authenticity plays a key factor while selecting employees. Employees who think outside the box are sought after within the company. It is necessary that the cover letter should be treated as a love letter and that the candidate should show that why he/she is the ideal match for the company. Also, stress the fact that you are an invaluable candidate who has the necessary skills and talent to keep the company forward and also increase the output of the company. By explaining all these factors through your cover letter, you are thereby increasing the chances of your selection and you will be seen as a valuable individual for the company.